I had a good week thrifting last week! This is $30 worth of stuff! Most things were $1, $2, or $3. Most were in excellent condition. 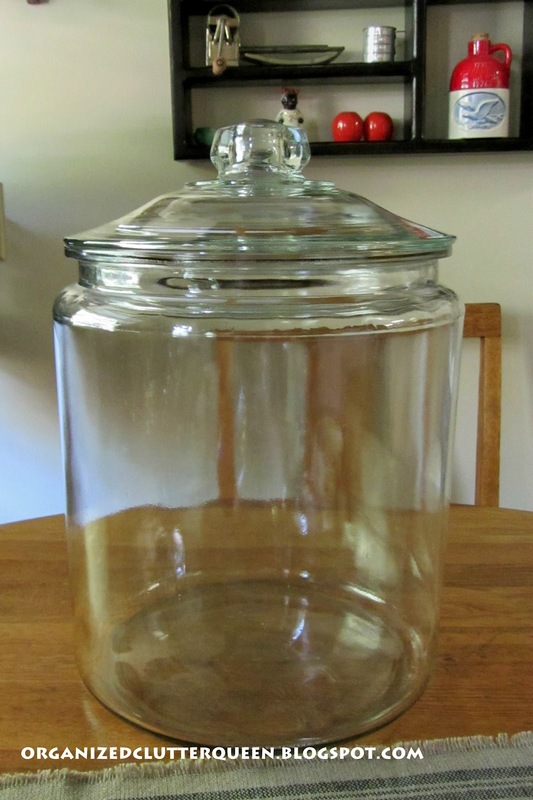 Can you believe the size of this clear jar with lid? It has to be 2 gallons and no damage. I can fill it with some kind of orbs (actually, you name it, a lot of things will fit in here), and it will be handy for Christmas decorating. 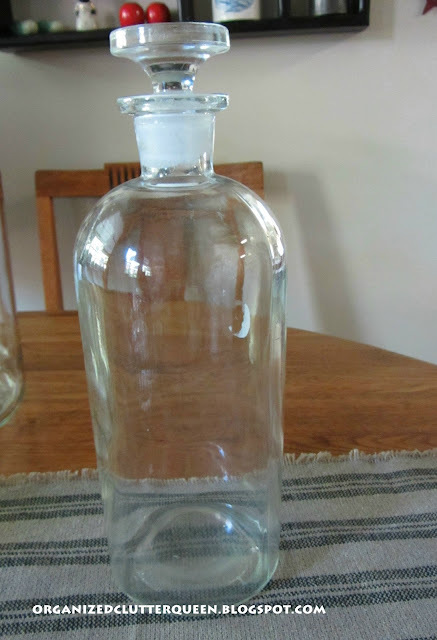 A vintage bottle marked TCW Co. A great buy at $3. Great condition. A Queen Anne tea cup marked "Lady Sylvia". $2, and no damage. I think this is an egg cup by Arklow, Republic of Ireland. No damage. A vintage glass vanity jar. Unmarked with silverplate? lid with mirror. Vanity jars happen to be one of my collections in the bathroom. 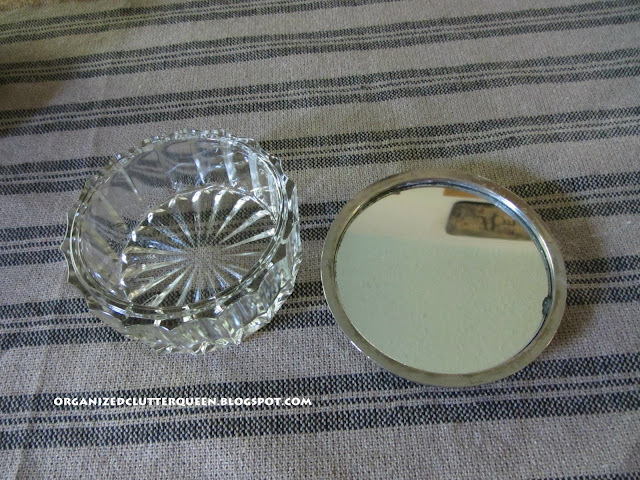 The mirror has a little silvering missing around the edges otherwise great condition. This is a McCoy flower pot. 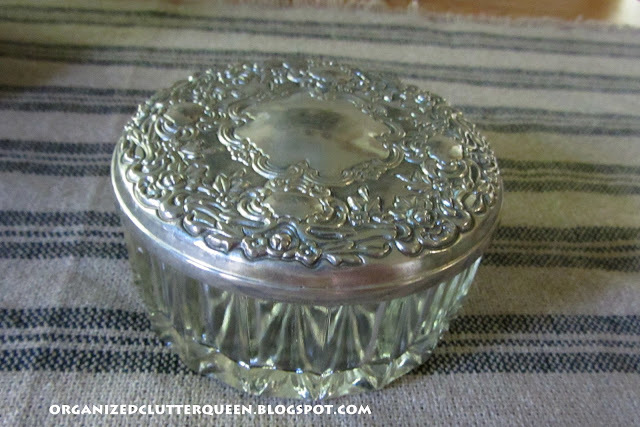 It has a small chip on the top and is crazed from use as a flower pot. $1.00. 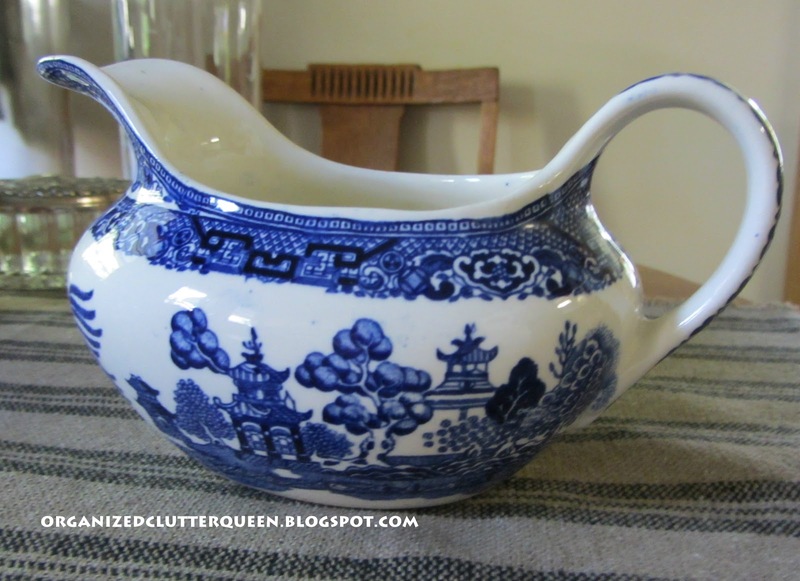 An unmarked Blue Willow gravy server. Great condition. This footed candy dish is unmarked. It has a silver in the glass' top edging. If anyone knows the maker or any information on this piece, please let me know. No damage. 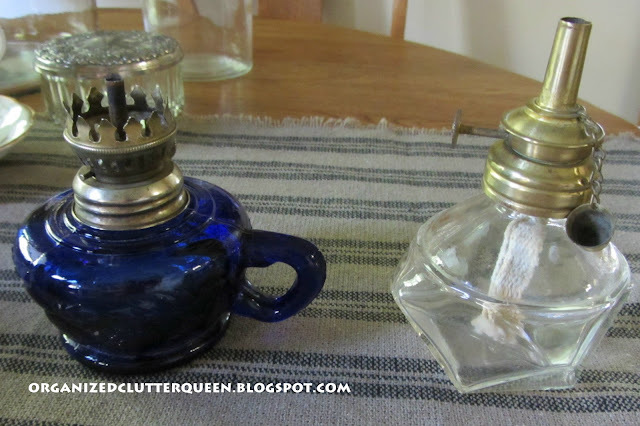 Two miniature oil lamps at $1 each. No chimneys but I'm pretty sure the one on the right never had one. It is marked HR on the bottom. It has a little cover attached by a chain. The blue one is unmarked. If you know the maker on these I would appreciate your comments. 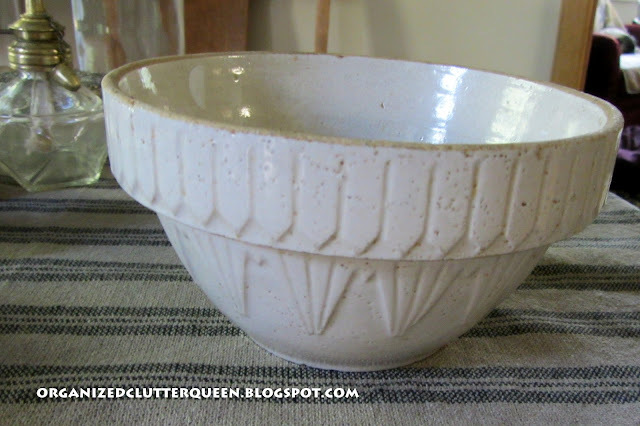 These old crock mixing bowls are a favorite of mine. I have several but what's one more. Unmarked. Minor imperfections. 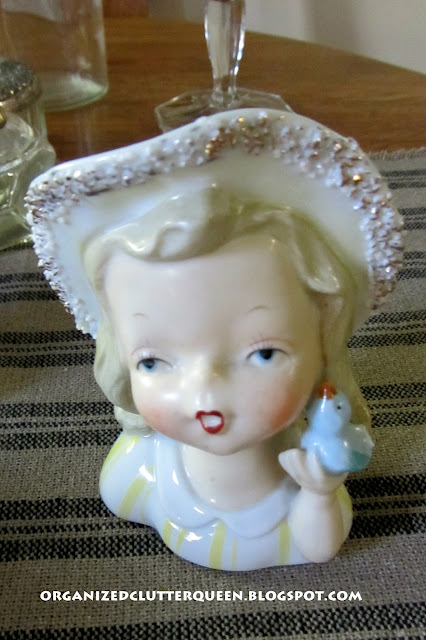 Even a little girl with a bird head vase. I collect head vases. This one is not particularly valuable. The tail is chipped on the bird. But for $1, who can argue! I hope you enjoyed one of my best weeks thrifting! I have the same large jar! I use it at Christmas for cookies but I sure like your idea of orbs and such as the rest of the year it is hidden away in a cupboard! 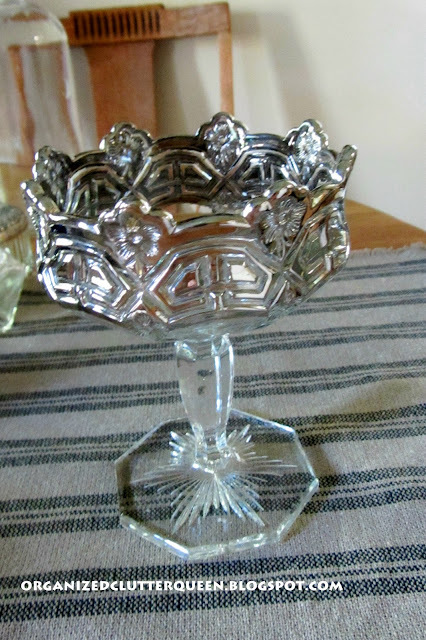 Hi Carlene....great finds....I think that candy dish might be some kind of carnival glass....and the bowl is a fantastic find!! Hi Carlene! You did great and I love all of the treasures you found! I know you'll put them all to good use in making pretty. You found some wonderful items. 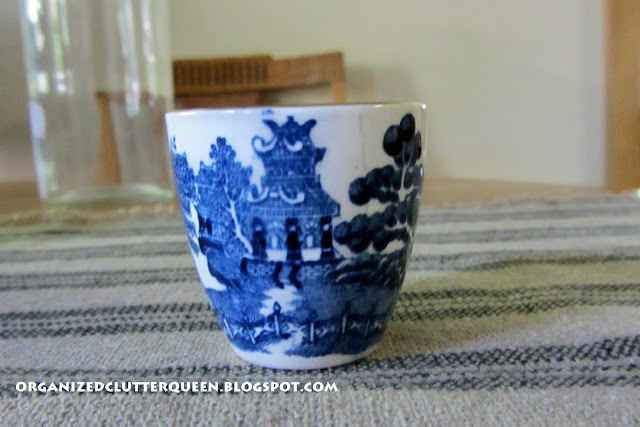 I love the teacup and the blue and whites! It's fun finding treasures and putting them to good use all over again. Thanks for sharing and have a wonderful 4th of July holiday. 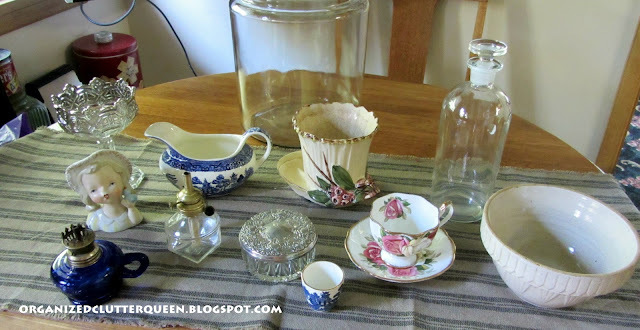 The Lady Sylvia and the vintage jar is a fave and I really envious of your Goodwill in the US. TY for sharing your great finds. You had a great thrifting week! I love that big jar, so many uses!! I also love the McCoy planter and that Blue Willow creamer! Great finds! Oh, yes. You are going to have to open a shop soon. But you did get some great deals. That head vase would have been priced high even with the chip. She is adorable! Fabulous Finds! I love the big jar, the apothecary bottle and that sweet little head vase. Great finds. I love the blue oil lamp. Thanks for sharing at the All Star Block Party. 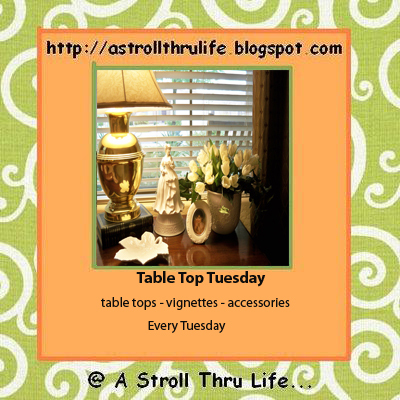 It is called Wednesdays Adorned From Above Blog Hop. I hope to see you there. Have a great Day. Great finds! A little jealous of a few of them! Thanks for sharing on the All Star Block Party! Newest follower. So many lovely finds! I really love the large jar with the lid in the first picture. You certainly found some great deals! I have a giveaway that will be ending Saturday night so if you would like to enter I'd be delighted to have you stop by! You hit the jack pot with your tabletop treasures! The teacup is lovely. The cup looks fluted. Love roses! Happy Tea Day! Great finds! 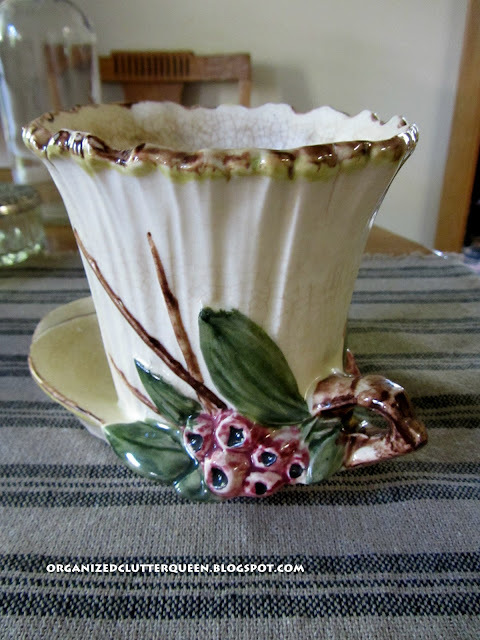 Your Queen Anne Teacup is gorgeous! So many great finds! The tea cup and saucer are gorgeous. I love the candy dish and the little girl is precious, especially for $1. 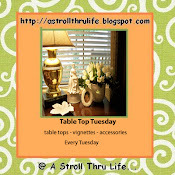 Hello Carleen, I am so glad you joined in Tea Cup Tuesday! Your thrifty finds are amazing. I wish I was as lucky, Lol! 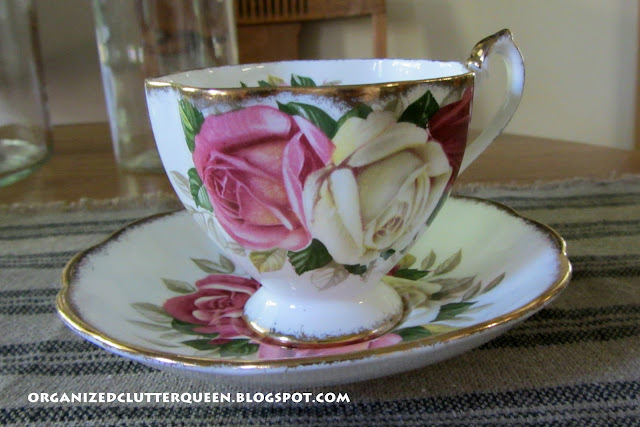 My favorite, of course, is your rose tea cup....for two bucks! Wow, that is a real find. It is a really pretty cup too, I love the shape as well as the design.